This entry was posted in Hunger & Poverty, News & Views, Quotes, Spirituality & Religious Writings and tagged caring, compassion., hoarding, legitimate needs, Mahatma Gandhi, regulations, riches, social justice, stealing, theft, true community, wealth on April 18, 2017 by Ray Buchanan. Amassing wealth is morally indefensible in a world where poverty and hunger still stalks millions. Why do we still respect and look up to those who flaunt their wealth with lavish lifestyles when sharing that wealth could be saving countless lives? Justice in today’s world means sharing with those in need, caring for those suffering, and living as a global family. Amassing wealth is just the opposite. 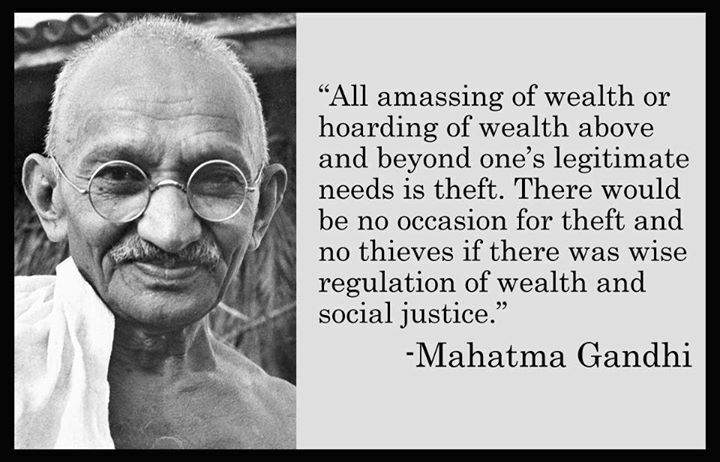 This entry was posted in Hunger & Poverty, Quotes and tagged caring, global family, hoarding, legitimate needs, Mahatma Gandhi, regulations, riches, sharing, social justice, theft, wealth on October 11, 2016 by Ray Buchanan. Normally, I do not think too highly of resolutions and statements issued by boards and other legislative bodies. Words are cheap. I am much more impressed with action. However,I applaud this statement by the World Methodist Council. I have been in South Africa numerous times and have seen firsthand the violence brought about by irrational xenophobia. I also know and am proud to call Ivan Abrahams, and my friend. I have seen him struggle with this issue when he was Bishop of the Methodist Church of South Africa. He has a true heart for the oppressed, the refugee and the stranger in our midst. He is a man of faith and action. I have also visited with refugees camped in Methodist Church sanctuaries in the heart of Johannesburg. I have heard their stories and felt their fear. I have seen the anger and rage directed at these refugees. It is too often incited by those with hidden agendas and those whose motives should be held up for closer inspection. It is manufactured on fear and an appeal to nationalism. Xenophobia is the fear of the stranger. There’s nothing Christian in such a response. Perfect love casts out fear. 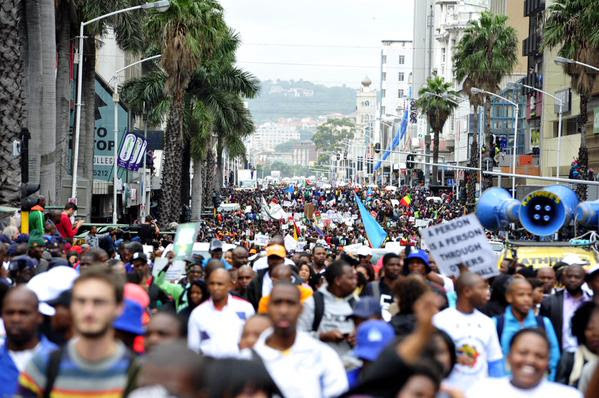 Peace March in Durban, South Africa on 16 April 2016. In the wake of escalating violence against foreign nationals, refugees and asylum seekers in the Republic of South Africa, World Methodist Council representatives express concern and disappointment at these clear violations of human rights. General Secretary Ivan Abrahams and the Social Justice Committee of the World Methodist Council issued this joint statement today condemning the violence and attacks:The World Methodist Council condemns these attacks which so clearly undermine human rights and dignity. We applaud the actions of Methodist family members within the Republic of South Africa who have stood up against these human rights violations. We also welcome the recent statements of President Zuma and senior government officials. We further support the marches and events held to bring awareness to take a stance against such atrocities. We pray that they are successful in continuing to promote initiatives toward peaceful coexistence. We implore the South African government to protect the rights of all people as enshrined in its Constitution. We further call on Methodists and Wesleyans within the neighboring countries of South Africa to stand in solidarity with and aid all those affected by these attacks. We are one human race. Let us all continue to pray and speak out against the injustices throughout our world. This entry was posted in Hunger & Poverty, News & Views, Uncategorized and tagged asylum seekers, Christian, constitution, Durban, foreigners, human rights, injustice, Ivan Abrahams, love, peace march, pray, refugees, social justice, solidarity, South Africa, violence, World Methodist Council, xenophobia on April 21, 2015 by Ray Buchanan. Reinhold Niebuhr has long been one of my favorite theologians. He was a true religious leader. His intellectual power and capacity to realistically deal with the social issues of his day ranks him among the ablest of philosophers, as well. He was a Christian idealist that demonstrated the essential spirit of Christianity. Through his early experience as a pastor for thirteen years in Detroit, Niebuhr developed his own interpretation of Christianity. He came to understand that the true meaning of the gospel was in direct conflict with most of the customs and attitudes of contemporary society. Niebuhr finally reached the conclusion that the church cannot save a person’s soul without addressing the kind of life they live in the world. That’s when the Christian gospel became a social gospel for him. And what is so compelling for me about Niebuhr is that he fully understood that Christianity could not be allowed to be seen only as vague generalities. That the ministry is particularly tempted to the self-deceptions which afflict the moral life of Christians today is obvious. If it is dangerous to entertain great moral ideals without attempting to realize them in life, it is even more perilous to proclaim them in abstract terms without bringing them into juxtaposition with the specific social and moral issues of the day. But, as shown by the opening quote, even Niehubr’s passionate concern for Christianity to have a direct and practical impact of the economic and social issues of his day never displaced his deep and essential religious faith. That’s the power of Christian idealism. This entry was posted in Quotes, Spirituality & Religious Writings and tagged Christianity, church, Detroit, faith, gospel, history, idealist, leadership, ministry, morality, pastor, philosophy, Reinhold Niebuhr, social gospel, social justice, theology on March 10, 2015 by Ray Buchanan.